Mutts turn mangy. Kittens’ chins break out in pimples. Dogs pepper the rug with dandruff. 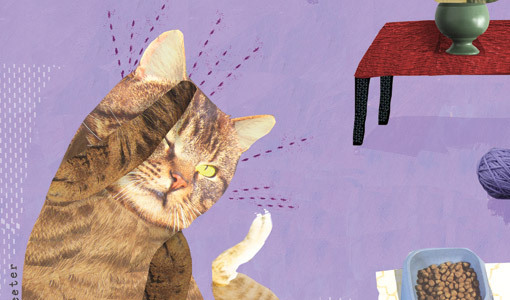 Cats scratch themselves at a feverish pitch. Our pets are susceptible to hundreds of bacterial and fungal infections, parasites and autoimmune disorders of the skin—ranging from the merely annoying to the downright deadly. So it’s no wonder that dermatological issues are the number one reason that dogs and cats end up at the vet. “The skin is an organ we can see,” says Lluis Ferrer, who oversees the veterinary dermatology service at Tufts. So although you can’t tell whether your dog has a headache or tightness in the chest, an itch that won’t quit is easy to spot. “If your cat has a growth on her face, you are going to notice that immediately, versus a growth on her pancreas, which you won’t be aware of until after it starts causing some serious problems,” says Ferrer. Owners often worry that a pet’s skin condition might be contagious—and rightly so, in some cases. You can get ringworm, an itchy fungal infection, from your cat. The bottom line is that healthy skin is important to your pet’s well-being. Essentially an envelope for the body, the skin keeps good things in (water and electrolytes) and bad things out (toxins, germs and UV rays from the sun). It also helps your pet maintain a healthy body temperature by regulating blood supply and sweat gland function. When it comes to all things lumpy, bumpy, red and spotty, pet owners often assume a veterinarian will be able to diagnose a skin disease just by looking at it. Not so, says Ferrer, who goes beyond skin deep to try to identify the molecular causes of many dermatological conditions—from why Shar-Peis’ skin is wrinkled and prone to chronic infections to why certain dogs die from infestations of the typically harmless parasitic mites known as Demodex, which live in the hair follicles of most mammals, including humans. Despite the mind-boggling number and diversity of dermatological problems in animals, the skin has a limited repertoire of signals—itching, hair loss, bumps and scales—to give owners and veterinarians clues into what’s going on. Getting to the right diagnosis is important. “First, we want to make sure it’s not something that can be easily treated,” says Andrea Lam, a board-certified veterinary dermatologist who works with Ferrer at Tufts’ Foster Hospital for Small Animals and at the Tufts VETS clinic in Walpole, Mass. Symptoms such as itchiness, hair loss, smelly ears, head shaking, foot licking and skin lumps could signal a skin problem. Fleas and other contagious parasites—such as sarcoptic mange mites, which a dog can pick up if coyotes and foxes live nearby—are common and easily treatable causes of extreme itchiness and hair loss. A bacterial or yeast infection can be cured with antibiotics or antifungal drugs. To diagnose an infection, a veterinarian presses a glass slide directly onto a lesion or sticks a piece of tape to the affected area. “Then we can look at it under a microscope in the exam room and show the owner the yeast or bacteria right there on the spot,” says Lam. By far, the most common cause of skin infections in otherwise-healthy animals is allergies, which can morph that body-protecting envelope into a sieve. “If you think about your skin, its structure is like a brick wall—nothing penetrates it,” says Lam. “But an allergic dog has skin that’s more like a crumbly stone wall. There are all these tiny gaps where environmental allergens like dust or mold can seep through and cause an inflammatory reaction.” The warmth of inflamed skin creates the perfect breeding environment for the normal supply of yeast and bacteria living on the skin to multiply, she says. Although there is little research data on pet allergies for comparison, it appears that atopic dermatitis—a.k.a. eczema, the itchy, scaly skin caused by allergies—is far more prevalent in dogs and cats than it was a few decades ago, according to Ferrer. “The situation is similar to that in children,” says Ferrer, who notes that as many as 10 percent of all dogs and between 10 and 15 percent of children suffer from atopic dermatitis. It is not known why more pets (and kids) have allergies. One explanation, Ferrer says, is the “hygiene hypothesis,” which suggests that Western society’s obsession with disinfecting every surface in sight has made animals’ immune systems hypersensitive to foods and other allergens. Other suspects include environmental and chemical pollution, which may harm the immune system, and genetic changes that have occurred over generations. Because dogs and cats can be allergic to many things, identifying the culprit requires time and a bit of trial and error. Until an allergen is confirmed, your veterinarian may recommend antihistamines, such topical treatments as shampoos and sprays and even steroids to keep your pet comfortable. If a pet’s symptoms diminish, the owner is instructed to give the pet its old food once more to see whether symptoms get worse. “Animals with food allergies will have a reaction within days, sometimes within hours,” Lam says. If the dietary regimen doesn’t work, the next target is environmental allergies. Tufts veterinary dermatologists perform a blood test in combination with a skin allergy test, which is similar to the prick test for people suspected of having allergies. Lam says that roughly 25 percent of her patients with environmental allergies test positive for an allergy to human dander. Unlike people with pet allergies, dog and cats typically do not experience respiratory problems as a result of human dander, but they can become extremely itchy and develop secondary infections just by being around us. Fortunately, your veterinarian will never tell your dog or cat to find you a new home. Instead, a vet can develop an immunotherapy regimen for your pet’s most serious allergens. Administered as a series of injections over many months, these allergy shots contain minute diluted amounts of substances to which your pet is allergic. “Each pet has a totally customized plan,” says Lam, noting that immunotherapy improves symptoms in about 70 percent of cases. “If a client is very lucky, the pet will improve in the first three months, but results can take a full year,” she says. However, most owners say their pets’ comfort outweighs the lengthy treatment. Allergies are not as common in horses as they are in small animals, but diagnosing and treating them is tricky. Environmental allergies in horses are quite common, caused by dust, pollen and molds, which thrive in the fields and stables where they spend most of their time. In addition, “a lot of horses are extremely sensitive to insect bites,” says Londoño. There are a number of steps owners can take to lessen animals’ exposure to bugs, says Linda Frank, V85, a veterinary dermatologist at the University of Tennessee’s Veterinary Teaching Hospital. The most common cause of insect allergy in horses is Culicoides biting midges, which feed at night, Frank says. She recommends that owners keep their horses inside from an hour before dusk to hour after dawn and spray them nightly with insect repellant. Installing a fan in the barn is also helpful, because these insects are less likely to hang around if there’s a breeze. And be sure to eliminate pools of standing water, where the bugs breed.